Omega-3 fatty acids are the precursors to ‘anti-inflammatory’ metabolites – that is, once ingested, they turn into anti-inflammatory molecules, thus generally preventing inflammation. Adequate consumption of omega-3 fatty acids is typically linked to a lower incidence of depression 1-5, a decreased prevalence of age-related memory loss and a lower risk of developing Alzheimer’s disease 7. They play a crucial anti-inflammatory role in the prevention of atherosclerosis, heart attacks8, cancer6, diabetes9, and rheumatoid arthritis10. They are necessary for optimal development in children, brain function, and skin health. Their counter part, omega-6 fatty acids, have a rather opposite function, producing inflammatory responses (for example, pain), in order to alert the body in case of a problem. Even though we require both these fats (this is why they are called ‘essential’), we don’t have the enzymatic capacity to synthesise them (we can’t make them ourselves). Therefore, their presence in our bodies is entirely dependent upon the food we consume. Maintaining an optimal balance between the two types of fatty acids is critical to our wellbeing. Unfortunately, the omega-3/omega-6 ratio achieved by the Standard American Diet is severely out of whack. This means our bodies – including our brain – cannot function at an optimal level. Again, this is important to note, because research suggests that an imbalanced omega-3/omega-6 ratio is probably one of the main causes of the startling increase in the chronic diseases mentioned above since the start of the industrial agricultural revolution of the 1950’s11. Human beings evolved on a diet with a ratio of omega-3 to omega-6 essential fatty acids of approximately 1 to 1. Omega-3 fatty acids were (and still are!) found in most of the foods we consumed: fish, meat, wild plants, eggs, nuts and berries. Today, typical Western diets exhibit a ratio of 1:16. That is, we eat 16 times more omega-6 fatty acids than omega-3 fatty acids! This means that most people are deficient in omega-3’s, and have excessive amounts of omega-6’s. This is vastly different compared to the diet on which human beings evolved. The consensus these days is that a diet can consist of up to four times more omega-6 fatty acids than omega-3 fatty acids and still remain relatively healthy. This proportion promotes an anti-inflammatory disposition, helping avoid chronic illness. Why this imbalance in our diets? In the 1920’s, technology was developed to hydrogenate vegetable oils with the aim to improve their shelf life, increase their stability when deep frying, or to turn them solid (to create products such as margarine). A side effect of this process was a reduction in their omega-3 fatty acids content (A second undesirable effect: it converts some of the fatty acids to trans fatty acids. Dietary intake of these leads to a higher incidence of cardiovascular disease and diabetes12. See here for more information about trans fats). These newly refined vegetable oils became the standard for cooking, replacing the ubiquitous grass-fed (why this is important is explained below) lard and butter. 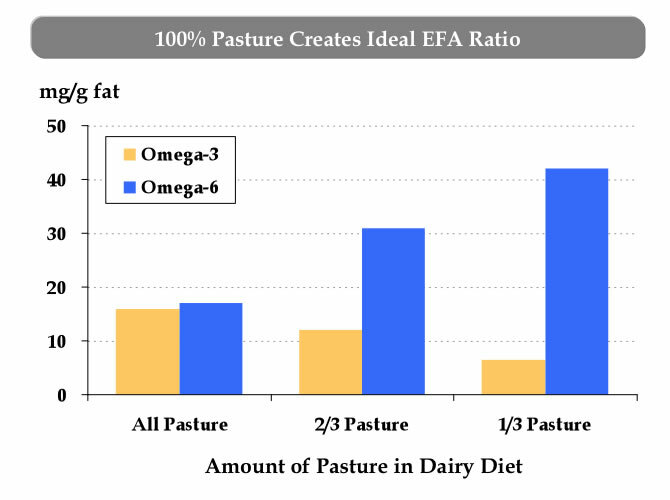 Furthermore, one of the techniques used to increase output by the industrial agricultural complex was to start feeding livestock and poultry a grain-based diet (which is cheap to produce but high in omega-6’s) instead of their natural ‘pasture’ diet (which is allegedly more expensive, but higher in omega-3’s). As a result of their diet, the animals’ meat is very high in omega-6 fatty acids13. The imbalance in the ratio of omega-6 to omega-3 in meat and poultry has grown significantly since the 1950s. In addition to animal meats14-16, green leafy vegetables17, and eggs18,19, farmed fish20 contain significantly less omega-3 fatty acids than those in the wild. To add insult to injury, around the same time as vegetable oils became the norm and livestock and poultry were being weaned off their natural diets, a particular health trend saw a steep decline. As early as the late 18th century, cod-liver oil was regularly consumed as a magical cure-all, though doctors knew very little about why it actually worked. Eventually, scientists discovered the high Vitamin A and D content of cod liver oil, but unbeknownst to those championing the supplement, it also contained a high amount of omega-3 fatty acids. The health benefits of omega-3’s wouldn’t be recognised until the 1970’s and with the arrival of laboratory synthesised vitamins A and D and the opportunity to escape the pain of having to pinch ones nose and drink the stuff, cod liver oil consumption experienced a sharp decline. By 1950, those who were unwittingly benefitting from the daily consumption of an omega-3 supplement no longer had that mitigating support, and their omega-3/omega-6 ration slid further into imbalance. How to improve your ratio? Avoid processed or fried foods whenever possible. When you can, choose grass-fed or pasture raised animal products such as meat, cheese, milk, and eggs. A quick comparison: a standard supermarket USDA egg has a ratio of 19.9:1. By enriching the chicken feed with fishmeal or flax, the ratio of omega-6/omega-3 decreases to 6.6:1 and 1.6:1, respectively 18,19. These fish meal or flax fed eggs are usually denominated as ‘Omega-3 eggs’. The best are still eggs from grass-fed chicks, which have a ratio of 1.3:1. Also, cook with grass-fed animal fats, such as butter, lard and ghee. If you must cook with oil, use ones which have better omega-3/omega-6 ratios, such as olive oil. Flaxseed oil is very delicate and does not do well at all in heat. Reserve it for salad dressings. Avoid margarine, cottonseed, sunflower, palm and corn oil. The most significant sources of omega-3 fatty acids are wild fish and game, grass-fed animal products, seaweed, algae, omega-3 eggs, and flaxseeds. In absolute terms, fish (especially salmon, herring and mackerel) is still by far the greatest source of omega-3 fatty acids. Unless you have access to good quality wild fatty fish several times a week, finding a high-quality fish oil is key to sustained health. 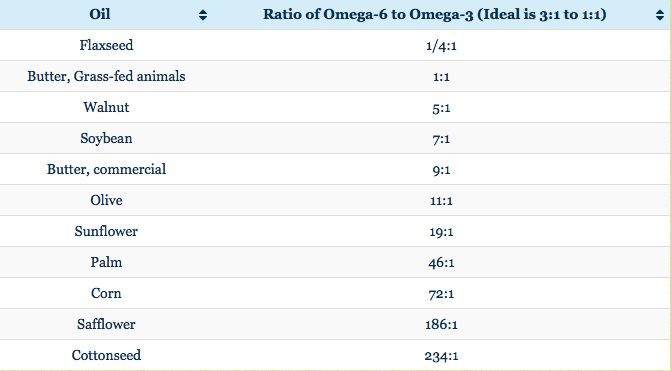 Just in case this isn’t confusing enough, note that the various types of omega-3 are not fully equivalent. The human body is not very good at converting the ALA type (found in vegetables and nuts) into the DHA and EPA types (found in fatty fish), which appear to be more needed. I am a fan of Quell Fish oil, and take 2 caps daily, which provide the recommended 2000mg of fish oil/day in EPA and DHA form. The oil is extracted from krill (unpolluted by heavy metals, sustainable), and is in triglyceride form (readily absorbed by your body). Most omega-6 fatty acids in the diet come from vegetable oils, such as linoleic acid (LA), which are used to fry and process foods. Peet M, Murphy B, Shay J, Horrobin D. Depletion of omega-3 fatty acid levels in red blood cell membranes of depressive patients. Biol Psychiatry 1998;43(5):315–9. Litin L, Sacks F. Trans-fatty-acid content of common foods. N Engl J Med 1993;329(26):1969–70. Locke CA, Stoll AL. Omega-3 fatty acids in major depression. World Rev Nutr Diet 2001;89:173–85. Maes M, Smith R, Christophe A, Cosyns P, Desnyder R, Meltzer H. Fatty acid composition in major depression: decreased omega 3 fractions in cholesteryl esters and increased C20:4 omega 6/C20:5 omega 3 ratio in cholesteryl esters and phospholipids. J Affect Disord 1996;38(1):35–46. Maes M, Smith R, Christophe A, Vandoolaeghe E, Van Gastel A, Neels H, Demedts P, Wauters A, Meltzer HY. Lower serum high-density lipoprotein cholesterol (HDL-C) in major depression and in depressed men with serious suicidal attempts: relationship with immune-inflammatory markers. Acta Psychiatr Scand 1997; 95(3):212–21. Maillard V, Bougnoux P, Ferrari P, Jourdan M- L, Pinault M, Lavillonnieree FF, Body G, Le Floch O, Chajes V. N-3 and n-6 fatty acids in breast adipose tissue and relative risk of breast cancer in a case-control study in Tours, France. Int J Cancer 2002;98:78–83. Lee TH, Hoover RL, Williams JD, et al. Effect of dietary enrichment with eicosapentaenoic and docosahexaenoic acids on in vitro neu- trophil and monocyte leukotriene generation and neutrophil func- tion. N Engl J Med 1985;312:1217–24. Raheja BS, Sadikot SM, Phatak RB, Rao MB. Significance of the n-6/n-3 ratio for insulin action in diabetes. Ann NY Acad Sci 1993;683:258–71. Robinson DR, Kremer JM. Summary of Panel G: rheumatoid arthritis and inflammatory mediators. In: Simopoulos AP, Kifer RR, Martin RE, Barlow SM, editors. Health effects of w3 polyunsatu- rated fatty acids in seafoods. World Rev Nutr Diet, vol. 66. Basel: Karger; 1991. p. 44–7. Simopoulos A: Omega-3 fatty acids in health and disease and in growth and development. American Journal of Clinical Nutrition 1991, 54:438-63. .
 Simopoulos AP. Is insulin resistance influenced by dietary linoleic acid and trans fatty acids? Free Rad Biol Med 1994a;17(4):367–2. Kirshenbauer HG. Fats and oils, 2nd ed. New York: Reinhold Publishing; 1960. Crawford MA. Fatty acid ratios in free-living and domestic animals. Lancet 1968;I:1329–33. Crawford MA, Gale MM, Woodford MH. Linoleic acid and lino- lenic acid elongation products in muscle tissue of Syncerus caffer and other ruminant species. Biochem J 1969;115:25–7. Eaton SB, Eaton III SB, Sinclair AJ, Cordain L, Mann NJ. Dietary intake of long-chain polyunsaturated fatty acids during the Pale- olithic. In: Simopoulos AP, editor. The return of ω3 fatty acids into the food supply. I. Land-based animal food products and their health effects. World Rev Nutr Diet, vol. 83. Basel: Karger; 1998. p. 12–23. Simopoulos AP, Norman HA, Gillaspy JE, Duke JA. Common purslane: a source of omega-3 fatty acids and antioxidants. J Am College Nutr 1992;11(4):374–82. Simopoulos AP, Salem Jr N. n-3 fatty acids in eggs from range-fed Greek chickens. N Engl J Med 1989;321:1412. Simopoulos AP, Salem Jr N. Egg yolk as a source of long-chain polyunsaturated fatty acids in infant feeding. Am J Clin Nutr 1992;55:411–4. van Vliet T, Katan MB. Lower ratio of n-3 to n-6 fatty acids in cultured than in wild fish. Am J Clin Nutr 1990;51:1–2.